The first weekend in February marks the unofficial beginning of the serious preps on the Triple Crown Trail, with three important stakes events and a number of key contenders taking to the track trying to earn a trip to Louisville. Gulfstream Park's stakes schedule was revised this year, with many races moved from their traditional dates and distances modified for the new racing surface. This weekend saw the Hutcheson and the Holy Bull stakes run on the same card for the first time. Proud Accolade overcame trouble to win the Hutcheson Stakes. The Grade 2 Hutcheson Stakes was lengthened to 7 1/2 furlongs, with six going to post in the $150,000 event. 4-5 favorite Proud Accolade lived up to expectation, despite a difficult trip. With half a mile to go he was checked, but jockey John Velazquez calmly saved ground on the turn then angled out to the 4 path at the top of the stretch to unleash his run. Powering through the lane, Proud Accolade was 4 1/2 lengths clear of late-running 14-1 shot Park Avenue Ball at the line. The final time was 1:29.90 over a fast track. It was 2 lengths back to 10-1 shot Vicarage in third. Velazquez said, "He tried to go into a hole that got shut off. But I guess it was a blessing because I snatched him up and brought him outside and he just jumped into it. We always thought he could go longer distances. We're scratching our heads about the last two races." Closing Argument winner of the Holy Bull Stakes. The Grade 3 Holy Bull saw a field of eight 3-year-olds going 1 1/8 miles, one lap around the new main track, for a purse of $150,000. 12-1 longshot Kansas City Boy led the field most of the way around, getting the half in 46.79 and 3/4 in 1:11.55. 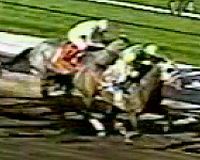 Cornelio Velasquez had 8-1 shot Closing Argument stalked him the whole way saving ground along the rail, then in the lane Closing Argument grabbed the lead with a furlong to go and edged away to win by 1 1/2 lengths in a time of 1:50.14. It was 1/2 a length back from Kansas City Boy to 3-5 favorite High Fly. Winning trainer Kiaran McLaughlin said, "At least this answers the question about getting the distance. You don't worry about it but I was pretty confident." McLaughlin is considering shipping him to Dubai for the $2 million UAE Derby. Going Wild became D. Wayne Lukas' newest Derby contender by winning the Sham Stakes. Santa Anita was the site of the $100,000 Sham Stakes at 1 1/8 miles on the main track. 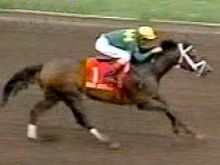 Victor Espinoza took 5-1 shot Going Wild to the lead right away, and with an easy trip on the front end set fractions of 46.82 and 1:10.68. Turning for home, he got 1 1/2 lengths clear and easily held off the late run of 9-1 shot Papi Chullo to get the win by a length in 1:50.18. It was just a neck back to 7-5 favorite Giacomo in third. 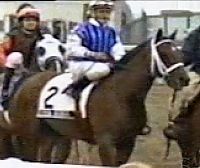 Winning trainer D. Wayne Lukas said, "His pedigree is full of distance horses, mile and a half, a mile and a quarter horses, so we might have a talented horse here that can get the two turns. He should be able to build off of that and get better. I will make a decision (on his next race) but the logical spot would be the Santa Catalina (March 5)."